Fell On Ice During a Storm – Do I Have a Case? If you have been injured as a result of a fall caused by ice, you may have a case even if the fall occurred during a snow storm. A property owner is not required to keep the sidewalks, driveways and parking areas clear of snow and ice during a storm. 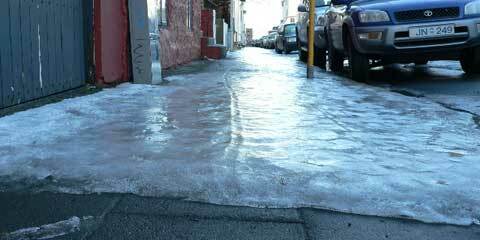 Therefore, if your fall was caused by ice that is accumulating or forming during a storm, there is no case. However, if you fell on “old” ice even during an active snowstorm, you have a case. You have a case because the ice that caused you to fall existed prior to the current snow storm. Furthermore, due to recently fallen snow, the “old” ice has been covered up making it impossible for you to detect the ice before stepping on it. If you suspect that “old” ice caused your fall, you should contact our attorneys immediately.